It’s been more than two years since Hurricane Sandy hurled its massive destructive muscle on the Atlantic coast, leaving behind wrecked lives and millions of dollars in damages. By now, most of the damage has been cleaned up, even if the nightmares persist for those whose homes and lives had to be rebuilt. For those of us who didn’t suffer property damage, Sandy made us aware of an electrical grid that almost never fails. We had to adapt to a temporary life without television, hot showers, and the other first-world perks we’ve come to rely on. We lived through seemingly endless days in the dark, and even when things began to get better we had to huddle with strangers at communal tables in coffee shops that had access to the web. And we waited on long lines to get a ration of gasoline to power generators and feed our cars, only to be told when we got to the front of the line that there was no more fuel left. In this issue we take a deep dive into some of the critical risks to the grid that threaten our accustomed way of life. 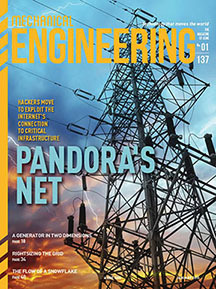 This month’s cover story, “Pandora’s Net” is a fascinating article that reviews some of the vulnerabilities in the grid that can be exploited by savvy hackers. “All the stuff we’re doing in Western society in regards to cybersecurity is probably ten years or so behind the curve of what the bad guys are doing,” a security consultant told Brittany Logan, a journalist who spent several months researching this article for us. The implications of an electrical grid shutdown are severe. Many of us have lived through blackouts, some of which have stretched into weeks. We’ve also read in both academic literature and science fiction about doomsday scenarios from the effects of electromagnetic pulses from the sun, or from atomic weapons, or from terrorists, with the potential to take down the grid for much longer periods. But we mustn’t disregard the large portion of the world that has never been connected to a grid. In contrast to veterans of Sandy, students in the developing world regularly crowd around transportation hub parking lots to access just enough light from street lamps to do homework, and women often travel far by foot for clean water only to be turned away when the limited supply is exhausted. To 1.3 billion people in developing countries the path to global development is based on access to energy. The economic and quality-of-life benefits that emerge when poor communities have access to affordable electricity are transformative. Without it, obtaining clean water, refrigeration, and proper sanitation is jeopardized, as is the ability to access the Web and all of the world’s knowledge. This is why the topic of energy poverty shouldn’t be ignored in conversations about the electric grid. The threats to our energy infrastructure are serious, as this month’s articles detail, but so are the dangers to society if we overlook the people who have no energy infrastructure to rely on.